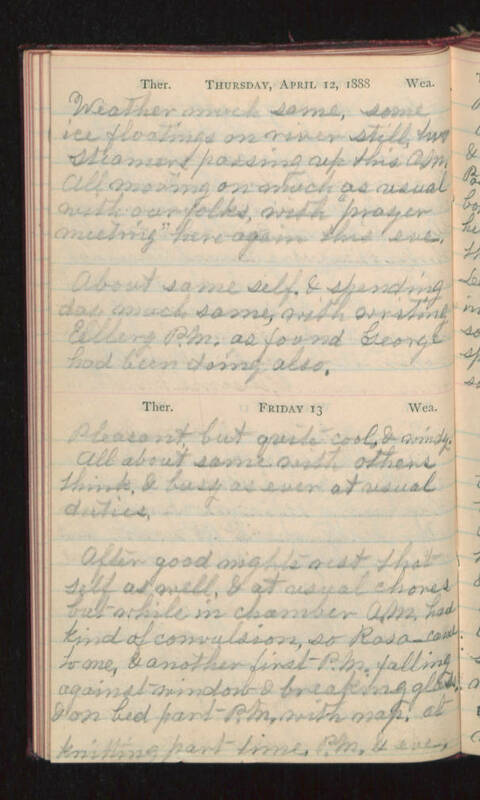 Thursday, Aprill 12, 1888 Weather much same, some ice floating on river still, two steamers passing up this A.M. All moving on much as usual with our folks, with "prayer meeting" here again this eve. About same self, & spending day much same, with writing Ellery P.M. as found George had been doing also. Friday 13 Pleasant but quite cool, & windy. All about same with others think, & busy as ever at usual duties. After good nights rest that self as well, & at usual chores but while in chamber A.M. had kind of convulsion, so Rosa- came to me, & another first P.M. falling against window & breaking glass & on bed part P.M., with nap. At knitting part time P.M. & eve.